Exceptional weather events do not just affect people but also wildlife. Tuesday morning, a grey seal pup was found on a Seabrook, N.H., road more than a third of a mile from the coast. While this was an extreme event, young seals are much more likely to be found on beaches over the next few days trying to catch up on their lost sleep. A normal part of seal behavior is to haul out of the water to rest. But with massive surf and tidal surges, most of their preferred nap locations have been under water for days. Just like kids, young seals need more rest than adults, and they can seemingly fall asleep anywhere, including prominent beach locations that might be frequented by winter beach walkers. The New England Aquarium asks people to not disturb these young seals. They are enormously cute, and people are often filled with an overwhelming desire to help, but the vast majority of the time what they need most is valuable rest and to be left alone by humans. Our visible presence is ALWAYS stressful to a young seal that is struggling to survive. Federal law requires people to not disturb them. Keep a distance of 150 feet, leash dogs, be quiet, and ask others to do so as well. Take the opportunity to observe from a safe distance this remarkable sight. 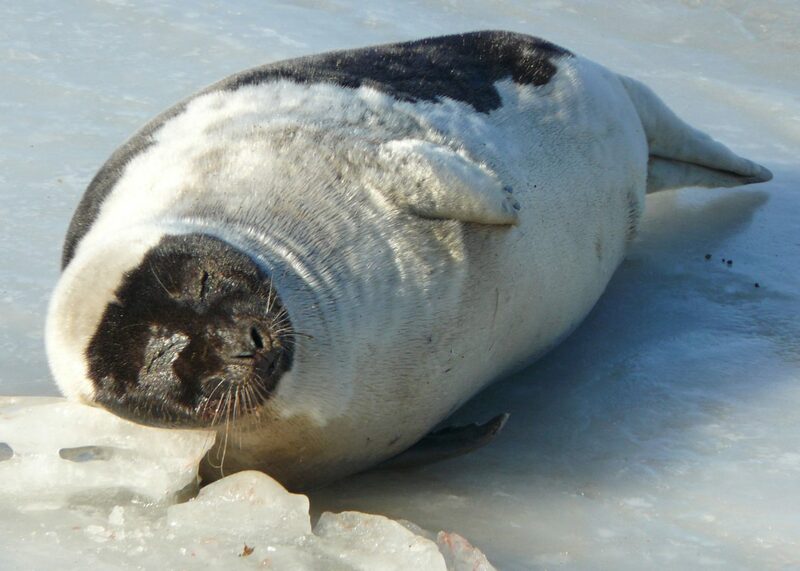 A harp seal visiting Massachusetts from Canada for the winter seems to strike a familiar nap pose with an ice block as a pillow. If concerned with the health of the seal, watch it closely from a distance. Note its location, size, behavior, or obvious injuries. Take pictures without approaching too close. If the animal appears in distress or is being harassed, call the marine animal rescue team in your area or the animal control officer of the town. If on beaches from Plymouth to Salem, call the New England Aquarium’s stranding hotline at 617-973-5427. Remember that it is easy share the shore safely with young seals.